On An Overgrown Path: Wagner's greatest work? That surprising verdict comes from Gustav Mahler who performed Wagner's youthful opera no less than twenty-seven times during his tenure at the Vienna State Opera. Was Mahler right and is the neglect of the opera due to its connections with Hitler and the notorious 'Rienzi effect'? Related trivia: the operatic society at my alma mater the University of Reading gave a fully staged performance of Rienzi in 1973 which was attended by none other than Maria Callas. More on music at Reading here. Source of header quotation is Kurt Blaukopf's Mahler and the composer is reported as voicing his opinion of Rienzi to his collaborators. 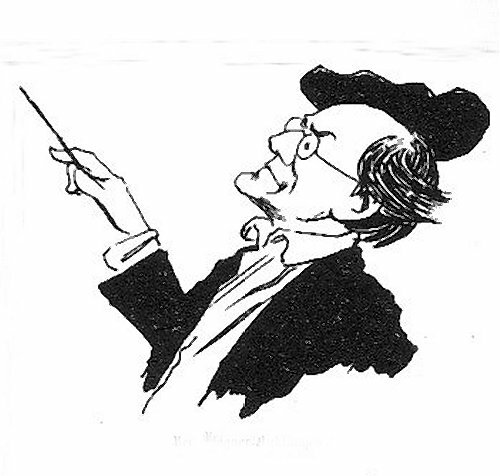 Cartoon of Mahler as Wagner is by the Viennese caricaturist Theo Zasche. Any copyrighted material on these pages is included as "fair use", for the purpose of study, review or critical analysis only, and will be removed at the request of copyright owner(s). Report broken links, missing images and errors to - overgrownpath at hotmail dot co dot uk Also on Facebook and Twitter. Well, Wagner would disagree I think. Rienzi tended to wax and wane in Wagner's personal sky. But I'm somewhat uncomfortable with Blaukopf's quotation, mostly because the very contemporary and dubious use of 'ultimately' sets me to wonder about the translations in general in his brief book on Wagner's life and world. John Deathridge, in a Musical Times article he wrote as a prelude to the 1983 ENO production (an excerpt can be read online), says that Mahler called the work 'the greaest musical drama ever composed'. This is very different, or at least it is to Wagnerians. Mahler toed the line well when it came to current Bayreuth orthodoxy, and it was, as Deathridge says, the position of Cosima and Chamberlain that Rienzi was the greatest 'Musikdrama', but a lesser work than those to follow, for they were the greater for being simply 'dramas', the point there being fusion of the arts.